Looking for Back Workouts for a wide, thick and Muscular Back. Don't let your back Training leave your back weak. These Best Workouts will force your Back & Lats to grow faster & Safer. As we discovered in the Back Exercises section, a strong back is the Cornerstone to Bodybuilding success. Not only due to its competitive advantage but also due to the fact that strong back will increase all your other major groups exercises significantly and immediately. Before planning a true, brutal Back Workout designed to hit all the Back Muscles from Upper to Mid and Lower ones, please read the Critical Points in Back Training and Back Safety Training articles. Its very important. You will only thank me you did. Train your entire back in one session of 2 but never leave any part - upper, mid or lower. Train your back only once a week but hit it real hard. If you train hard enough then you will not want to hit them again in the same week. Warm up and Stretch your back Muscles before, in between and after your back workouts. 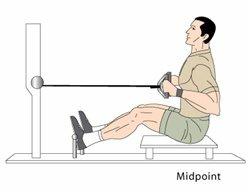 Incorporate Isometric contractions for additional tension generation. Form is very important. Back training is difficult so develop a mind-muscle connection for a better workout. Feel what you are doing. Quality rest and recuperation and Muscle Building Nutrition is a MUST. Plan A - Train your entire back as one unit. This is by far the commonest method. This means that you train your upper back i.e. Trapezius and Lats and Middle and Lower Back as One unit in the same workout. In this workout plan you train lats and mid back with rows in one workout. 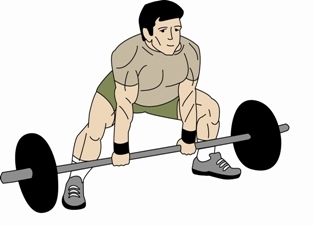 Deadlifts for lower back are done separately usually with Leg Training. The basis of these workouts is that Deadlifts train hamstrings as well, so many bodybuilders believe that they should be part of Leg Training. Plan C - Training Trapezius with shoulders and your remaining back separately. This is the push-pull split routine as discussed in Split Routines section. Beginners/Intermediates - Train your entire back together either as in Plan A or C.
Advanced trainers looking to compete can train using Plan B. Advanced Bodybuilders should listen to their bodies. They should know how their body responds to various workouts. It is difficult for beginners, but for Advanced Trainers who are looking beyond just muscle mass, its not optional, its mandatory. Now its time to learn the best Back Workouts. NOTE - All these Exercises can be learnt form the Back Exercises Section or the Exercise database. Warm Up and Stretching - They are CRUCIAL if you want to stay injury-free and have an awesome workout. ReadBack Stretching Exercises. It will take 5 minutes to read and another 5 to stretch your entire body including your back and I cannot stress the benefits more. Optionals - Pullovers - 3 sets of 8, 6 and 4 reps. Pull Downs - 1 Superset to failure. Shrugs - 4 sets of 10, 8,6 and 4 reps.
Upright Rows - 4 sets of 10, 8,6 and 4 reps.
Use weighted chins for additional resistance. There you have it. The Best Back Workouts you can ever have. All that remains is the Intensity of your training and only you can decide how much Intensity to put in. Also read Advanced Weight Training Principles to boost your Intensity levels to a higher level. Have A Great Back Exercise or Workout? Do you have you own back exercise or workout routine? Share it!